John has been an active member of the club since October 2013. His club car is a 1932 Ford Roadster. He also owns a 1951 Chevrolet. John is President of Material Damage Appraisal of Long Beach. Wife Charlene is retired from AAA after 39 years. John and Charlene have been married for 40 years. They have one son, David who lives in Long Beach. They also have a Golden Retriever, Brew and two kittens, Bud and Mick. 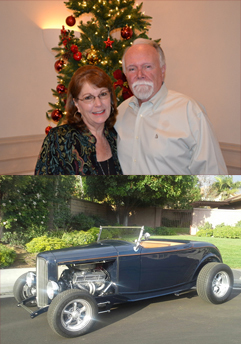 John has been involved with automobiles and a wide range of motor sports since high school. He's always got a few car projects going on in his garage. L. A. Roadsters: Very proud to be a member of the oldest and most prestigious car club. The members have done so much to make the sport enjoyable for everyone.